I made a purchase for this skincare set on a whim about 4 months ago, you may remember it from my haul video. I was looking to try out something completely new and thought I'd take the plunge into Korean brand Tony Moly. 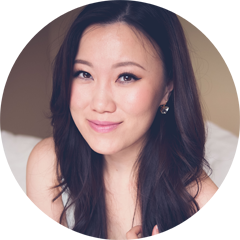 They are a large and prominent name in the beauty industry overseas, producing everything from skincare and body care to a full range of colour cosmetics. Their advertisement at the time, featuring the gorgeous pop band Brown Eyed Girls, quickly stole my heart. 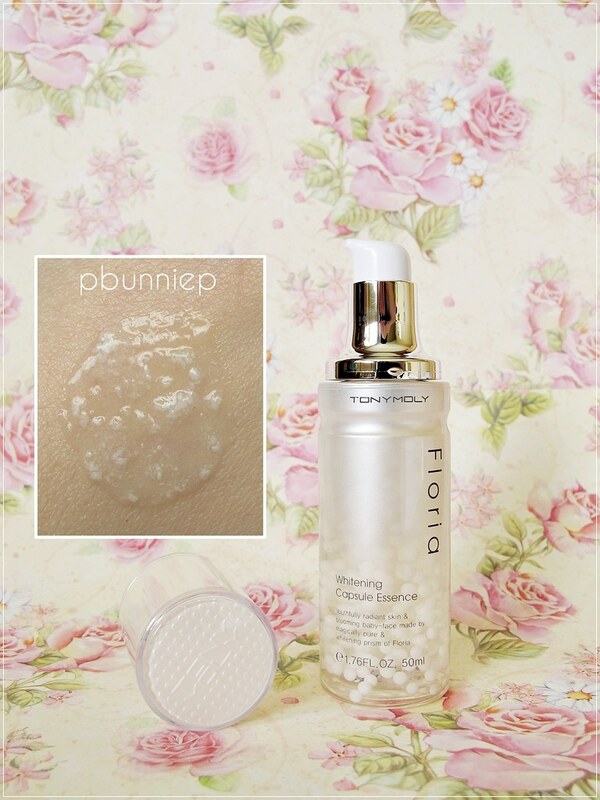 I settled on their Floria line as I loved the concept of using plant extracts in my skincare. Though I find it hard to go natural completely, I do try to fit bits of nature into my beauty routine when I can. And because I have fair skin, it's always a priority for me to keep it clear, bright and luminous. As per usual, I ordered a set of the essence and moisturizer together as I feel using these two together will give me a better understanding of the line and (hopefully) better results as well. With the little information available online, I blindly bought the moisturizer/emulsion without knowing that it contained mineral oil...my skin's kryptonite. But I'm jumping too far ahead of myself, let's start properly at the serum shall we? Would I repurchase: Uncertain but likely not. No you're not imaging things, this Tony Moly essence comes as a clear gel in which suspends drops of pearl like beads. They pop once you pump out the product and when applied to the skin leaves you with a slight pearly sheen. I'm thinking they are probably pearl powder pigments (see ingredients list). 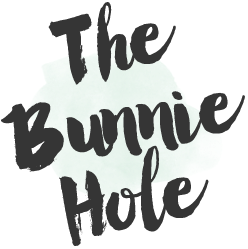 While I'm usually not a fan of gimmicky tricks (like menthol in my face wash), it quickly became one aspect that really loved about this product. It's especially nice to put on in the morning to look really bright and awake because it actually shows through irregardless of what moisturizer you apply on top. It's lightly scented (something synthetic smelling I'm afraid) but doesn't linger long on the skin. 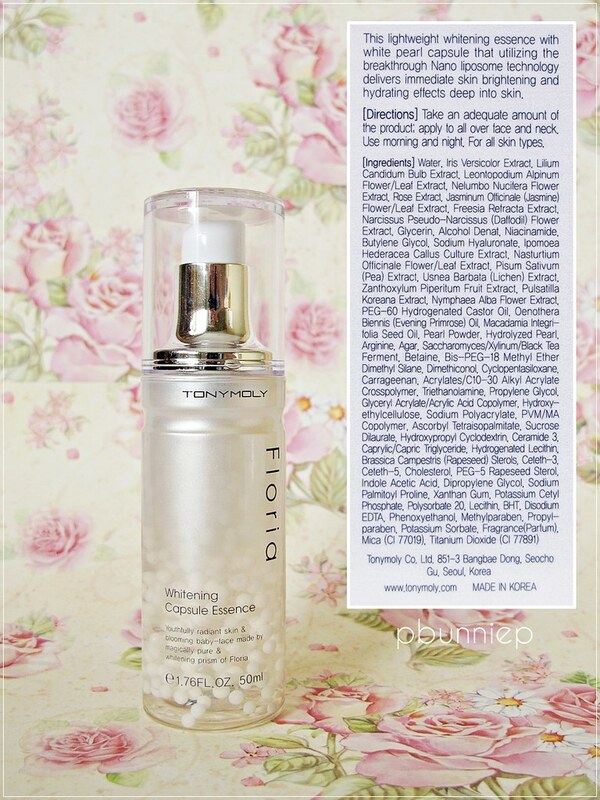 The ingredients list is loaded with row after row of impressive natural extracts, on the whitening side the most obvious additive is niacinamide which is supposed to have anti-inflammatory as well as skin brightening properties and is also something I've seen frequently in Western brands (especially in Olay). While this product claims to reach deep into the skin to illuminate from within, I found the results to be very mediocre. Pearl and mica illusions aside, it took almost a month for me to see visible results. It did brighten up my skin a tad and give it more life but sadly not to the same translucent results as my Hadalabo. On days that I have intensively exfoliated my skin, this did sting a bit (hello, alcohol) when I put it on but otherwise it didn't break me out or cause any other adverse reactions. With all that being said the lightweight texture was very enjoyable and provided just enough of a boost without being greasy in the summer time. It'd make a great option for those with normal to oily skin. Personally I'm quite a bit disappointed that I wasn't able to try it out properly with the emulsion together. TIP: This essence has the tendency to feel a tad sticky and leave a film like texture on the skin. Simply pop on a moisturizer over it and the feeling disappears leaving you smooth and comfortable. Now to continue my story about this unfortunate emulsion, it broke me out terribly because of the mineral oil. For those who are not allergic or have no issues with that, this does feel like a wonderful product and I have a feeling would have gone well with the essence and enhance it's effectiveness altogether. But alas I don't have much to say because I had to put it down after 3 days of terrible red spots. However I did think it might be helpful for you all to see photos of the product so here they are below. 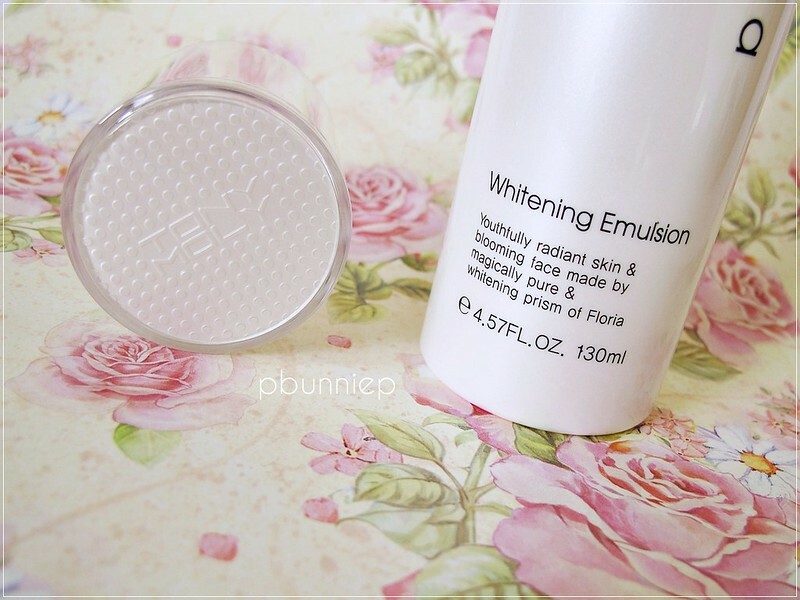 This emulsion or "lotion" as I would call it feels light and creamy in texture and glides on over the skin beautifully. In fact this product feels much fancier than it's affordable price tag and is something I might associate with a luxury brand. 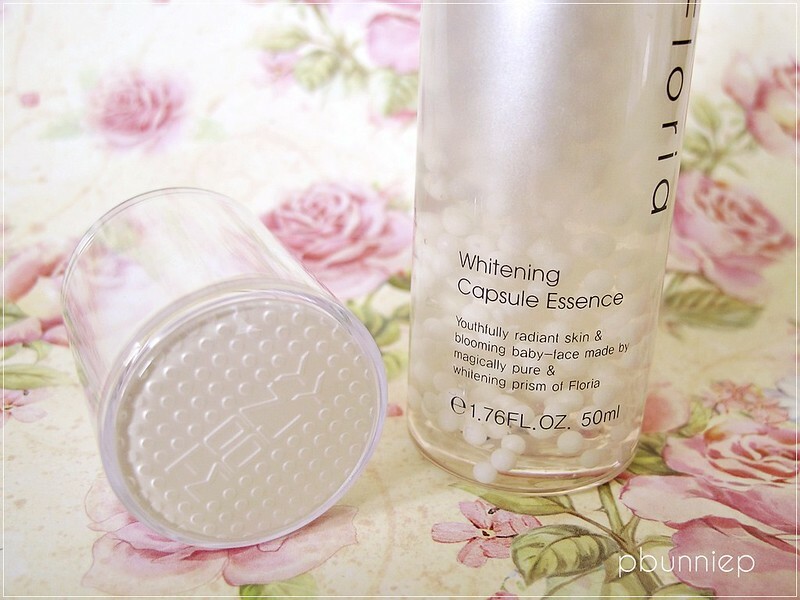 It also sealed off the Whitening Capsule Essence, taking away any residual stickiness and imparting supple and perfectly moisturized skin. 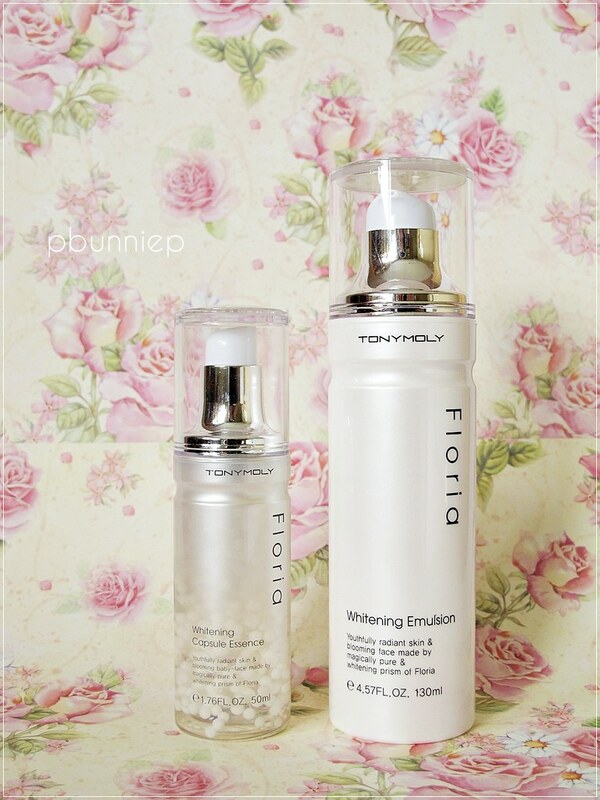 Given my limited success with testing out the Tony Moly line, I'd say this might be an option for those with normal, slightly dry or slightly oily skin and is looking for a little extra brightening boost if your skin it's looking a bit shallow or dull. It also might work better for anyone looking to maintain bright translucent skin rather than to treat any specific spots and discoloration. Approach carefully if you have sensitive skin or if you are reactive to mineral oil (for the emulsion). 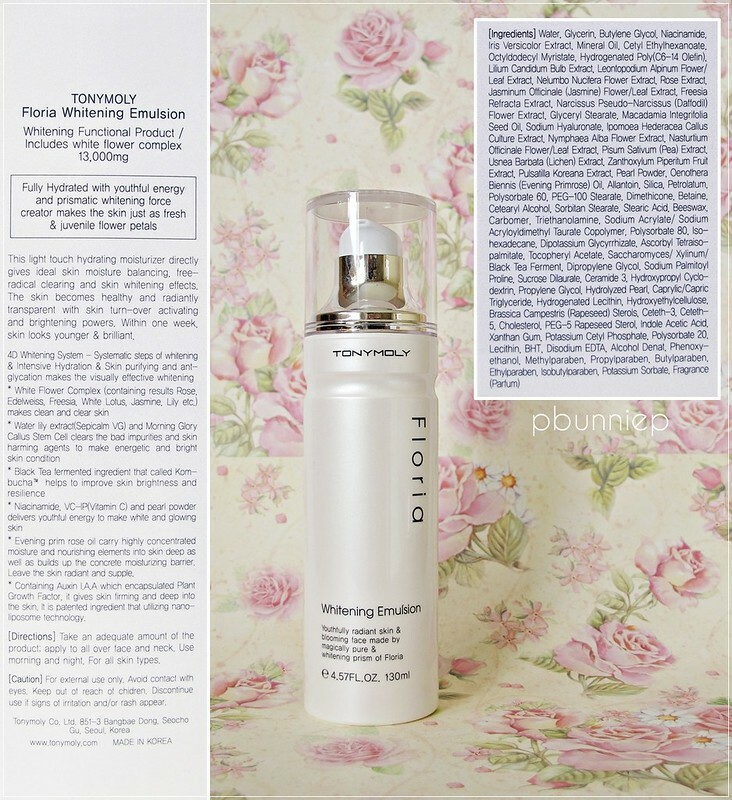 Tony Moly has a pretty extensive selection of products for the Floria line of products and there is a light cream moisturizer (in a tub) that has caught my eye. It's also mineral oil free! Might give that a go sometime in the future and revisit the Floria line. You can find out more about the entire Tony Moly brand by browsing their global website, click around just for fun like I love to do. Tried something from Tony Moly before? Let me know what's good! It always amazes me how long the ingredient lists for Asian cosmetics are...Anyway, these two seem interesting, but mineral oil is not for me either. Btw I love the photos you take! Mineral oils are not for me either but both looks so lovely! I sampled the Floria toner and liked it, smell-wise it was very nice, so maybe I'll try the lotion eventually. I already bought a fullsize of the quite light Dear Me Emulsion, but niacinamide is definitely a plus here. I bought the Emulsion and Toner. Although, I am wondering if you're aloud to use it on other parts of the skin like arms or legs? Is it okay to do that?